Magic Audio Converter and CD Ripper is your all-in-one solution for audio conversion, tag editing and CD-ripping. It supports over 20 different formats and you can convert multiple files in batch mode. The software is also easy to use, offering you an intuitive interface with all the features that you need. You can also play audio within the program, edit tags and more. Converting your music is just a matter of a few clicks and then you're done. 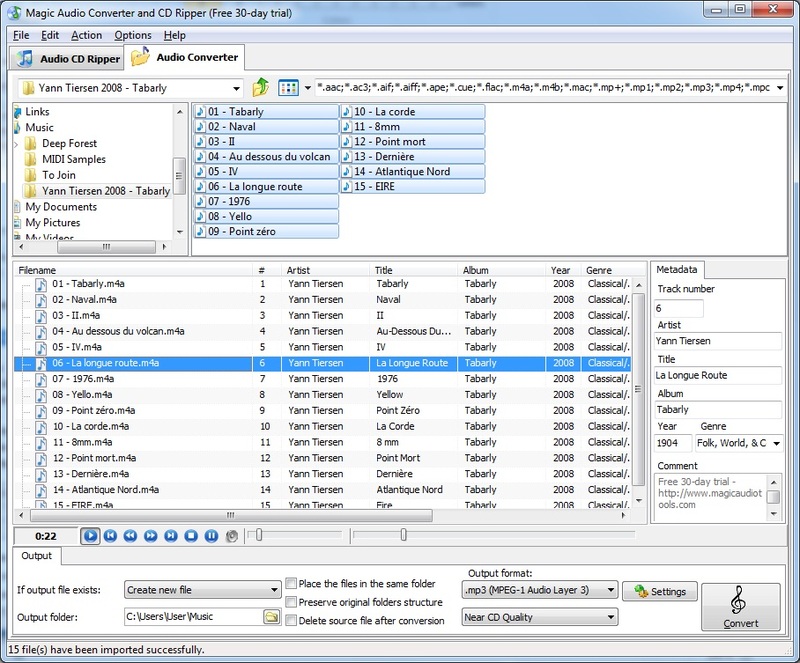 Magic Audio Converter allows you to convert music, edit tags and rip CDs. ...... These two steps, ripping and converting, allow you to manage your music library and play your songs on any audio device. Qweas is providing links to Magic Audio Converter and CD Ripper 2.5.8 as a courtesy, and makes no representations regarding Magic Audio Converter and CD Ripper or any other applications or any information related thereto. Any questions, complaints or claims regarding this application Magic Audio Converter and CD Ripper 2.5.8 must be directed to the appropriate software vendor. You may click the publisher link of Magic Audio Converter and CD Ripper on the top of this page to get more details about the vendor.